Katsushika Hokusai (1760-1849) Portraits of the Heroes of the Suikoden, 1829. Ehon album page. These three prints are very lovely indeed. They are original Hokusai illustrations to the first major publication of the Japanese translation of the 108 Heroes of the Suikoden (Chugi Suikoden Ehon) sometimes called Portraits of 108 Stars. In 1805 the publisher Kadomaruya started production of the Japanese translation of the Chinese novel Suikoden. 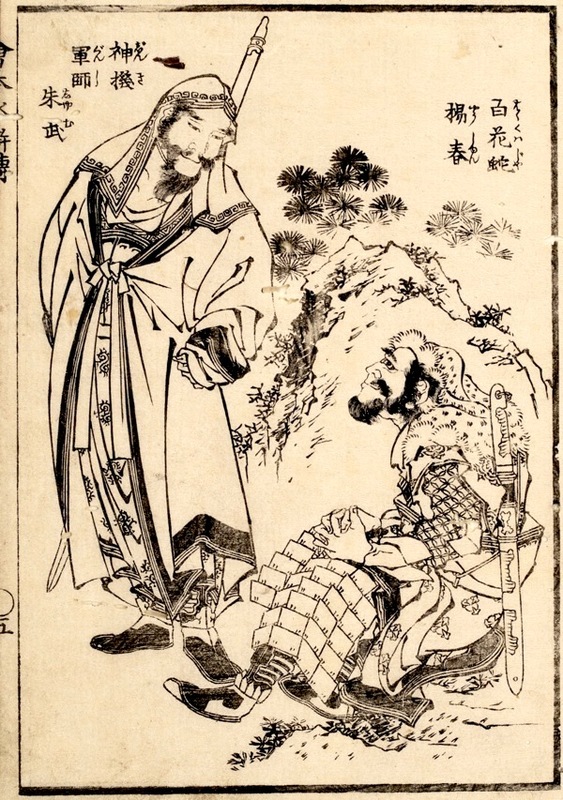 This was in part an historical account, in part a folk-tale, of 108 heroes released from a stone tortoise who became magnificent brigands and outlaws in fourteenth century China. They were later pardoned by the Chinese government and went on to defend the dynasty against attack. The story inspired the great series of prints by Kuniyoshi from 1827 that was to make him famous and establish the warrior print genre for half a century or more. Kadomaruya’s project lapsed but was picked up again in 1829 by the publisher Hanabusaya Heikichi with Hokusai as the illustrator. This was possibly in response to the overnight success of Kuniyoshi’s own version of the 108 heroes. The prints exist in all the major museum collections including the British Museum, London. These prints appear in Richard Lane, Images from the Floating World: The Japanese Print, Dorset Press, New York, 1982. These are beautiful pieces; each one is printed in monochrome; full size with margins. There is some worm damage to the edges otherwise fine condition. Very good impression.